The Brush Boys Basketball team capped off another successful season with a recent string of impressive individual honors. Head Coach Chet Mason was named Coach of the Year by the Western Reserve Conference and Cleveland’s Call & Post newspaper for his efforts in guiding the Arcs to an undefeated conference record of 14-0, and overall record of 20-3. Several players were also recognized for their outstanding play on the court during the 2019 season. Senior guard Andre Harris was named Division I Boys Basketball First Team All Ohio, while Senior guard DJ Dial and Junior forward John Hugley were named to the Division I Boys Basketball Special Mention Team All Ohio by the Ohio Prep Sportswriters Association and the Ohio High School Athletic Association (OHSAA). DJ Dial was also recognized as the 2019 Player of the Year by the Western Reserve Conference. 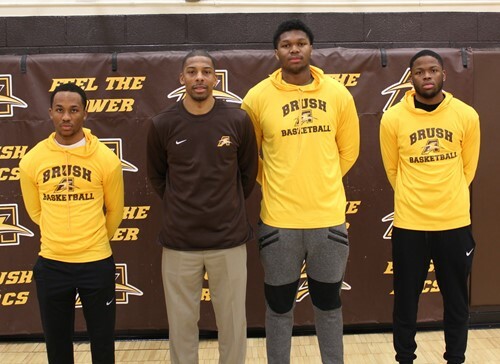 2019 proved to be another landmark year in the boys basketball program at Brush, as the Arcs advanced to the Division I Euclid District Championship and continued to build on a proud reputation as a known program statewide. Congratulations to Coach Mason, and students Andre Harris, DJ Dial and John Hugley for their award-winning athletic achievements!